Tony Iafolla decided it was time for a change. He had attended Johnson & Wales University, briefly, after graduating from Medfield High in 2001. He volunteered with Habit For Humanity in Central America before returning to Massachusetts and settling into a full-time landscaping job. A baseball and hockey player in high school, Iafolla continued to play summer ball in the Yawkey League, earning league MVP honors for his stellar play behind the plate. “My friends had nice homes and careers and my best friend, Zach Liber, got married,” said Iafolla. So he enrolled at Framingham State two years ago, dropped 40 pounds, and emerged this season as the team’s starting catcher, as a sophomore, at age 29. Iafolla, who batted .295 with 11 doubles, two triples, and two homers, was one of several local players who helped propel the Rams to a 26-17 record, the most wins in program history. The contingent included junior right fielder Will Crofton of Hopkinton, who hit a team-high .364 and was named to the Massachusetts State Collegiate Athletic Conference first team. “When I first started playing at Framingham State, a couple of the umpires who also worked the Yawkey League were saying, ‘Tony, what are you doing here?’ ’’ said Iafolla, who coaches the junior varsity hockey squad, and assists the varsity coach, at Medfield High, and also skippers the Medfield Fury’s U-14 AAU baseball team. Iafolla, who earned a spot on the Medfield varsity as a freshman (along with his buddy, Liber), was a team captain as a senior. A defenseman on the ice, he hails from a family of hockey players, including his uncle, Tom Ruzzo,who played at Dartmouth. A sociology major at Framingham State, Iafolla said he hopes to become a full-time coach after graduation, and will coach Boston youngsters this summer through the Head First Camp, a Boston Red Sox program. “My high school baseball coach, Mark Nickerson, encouraged me to play in the Yawkey League,” said Iafolla, who is with his fifth team, the Revere Rockies, after starting at age 19. 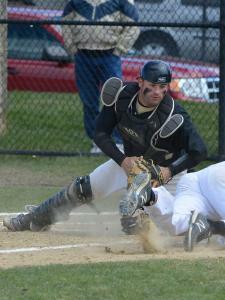 “Sean Callahan, who also played in the Yawkey League, knew I was coming to Framingham State, where he was the starting catcher, and encouraged me to try out. A football and baseball captain at Marian High in Framingham, where he was Catholic Central League MVP, he played Stan Musial ball last summer with the MetroWest Athletics. This spring, Crofton led the Rams with 59 hits and 32 RBIs, committed just one error, and struck out only 11 times in 162 at-bats. Crofton said the turning point this season came April 6, when the Rams swept a doubleheader at Massachusetts Maritime Academy, 14-4 and 12-0, and improved to 13-10. Framingham State’s roster of players with local ties also included junior infielder Justin Forman, a Watertown High grad who hit .313, and sophomore second baseman/left fielder Ivan Colon (Waltham High), who batted .266. The pitching staff was bolstered by freshman starter Ryan Bowen (Hudson High), who went 4-2 with a 3.73 earned run average; sophomore starter/reliever Brendan Busa (Framingham High), who was 3-2 with a 3.38 ERA; and freshman reliever Patrick Murray(Framingham High), who had a 3.98 ERA. Blumsack called Forman a “tough kid and tough competitor,’’ and Colon a “hard-nosed player who will only improve.’’ He added that Bowen has three pitches he can throw for strikes in any count, that Busa has the ability to become one of the top pitchers in the region, and that Murray has closer potential. Rounding out the local contingent were junior backup catcher Paul Everett (Franklin High), freshman pitcher Taylor Spaulding (Westborough High), freshman outfielder Matt Gerard (Milford High), and four other Hudson High grads — freshman infielders John Gill and Sean Parker, freshman outfielder Chris Tobin, and sophomore infielder Billy Rundlett.